S S Thaman is undoubtedly the busiest music composer in South India this year with almost close to 12 films released already this year and many more are yet to come. His recent album Ramayya Vasthavayya which was released yesterday was an instant hit. Presently he is Chennai taking part in the 100 years of Cinema celebrations. Now he has more than one reason to be happy. 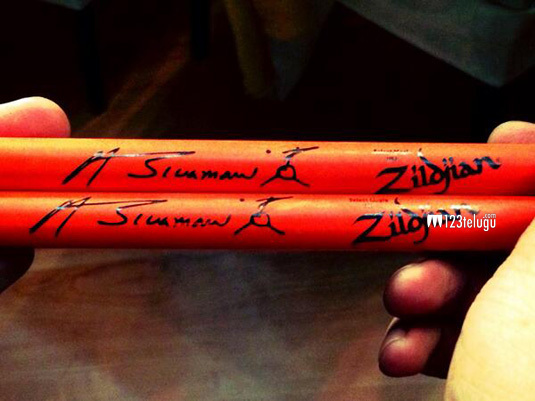 Ace drummer Sivamani has presented Thaman with a pair of Drum Sticks autographed by the drummer himself. Thaman was ecstatic with his new present and apparently considered it to be his life time achievement award and felt blessed with the present.